This blog is not a diary, so the contents will be modified without changing the date. 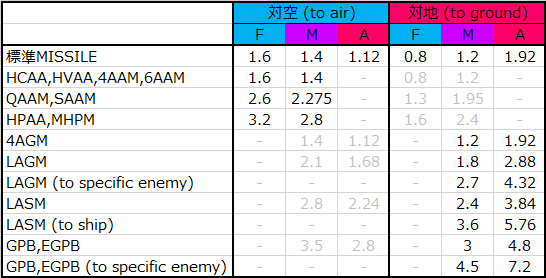 Berkut Method is a damage calculation method for ACE COMBAT INFINITY. Named after because damage is accidentally equal to one shot point to Berkut (Su-47) . This is adjustment value to raise(lower) the damage rank. # To SOLG, Multirole and Attacker have same ratio as Fighter. If enemy HP is less than 20, you can shoot it down. Utilize for checking the one shot kill line of orange or red.